BMW is expanding its model line-up even further with the 2 Series Gran Coupe, which will make its global debut at this year’s Los Angeles Auto Show before a market launch begins in the spring of 2020. The upcoming four-door coupe will join existing models in the 2 Series camp, including the coupe, convertible, Active Tourer and Gran Tourer. Before you get too excited, the 2 Series GC will have more in common with the MPV rather than the sporty two-door models listed. This is because the 2 Series GC will be built on BMW’s front-wheel drive UKL modular platform, which is used for the above-mentioned MPVs, as well as the F48 X1, F39 X2 and F52 1 Series Sedan. Oh, the German carmaker also stated the next-generation 1 Series will adopt a front-wheel drive layout as well, so make of that what you will. BMW didn’t provide more information to accompany this important revelation, but we should expect a range of three- and four-cylinder petrol and diesel engines to be available. These can be paired to a six-speed manual gearbox, an eight-speed automatic or a seven-speed dual-clutch transmission, with all-wheel drive being optional. The carmaker did release this teaser image of the 2 Series GC, along with some descriptions for its design. For instance, the 2 Series GC will have a notchback design, and it will “combine a dynamic charisma and an expressive design with a high degree of everyday suitability also in the premium compact segment.” Great. Looking at the provided image, the vehicle in question does have a sleek look about it, with contoured C-pillars and a rakish roofline that leads into a short rump. We can also spot what looks like a small lip spoiler and a character line that goes through the door handles, which meets with the slim taillights with distinct graphics. This image certainly provides more promise, as spyshots of development cars in the past wore quite a big of camouflage and fake body panels to mask the car’s shape. We’ll only be able to see the 2 Series GC in full when the Los Angeles Auto Show kicks off in November. 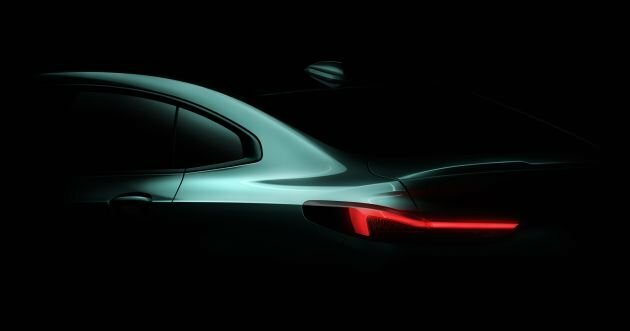 The post BMW 2 Series Gran Coupe to debut at LA Auto Show appeared first on Paul Tan's Automotive News. 0 Response to "BMW 2 Series Gran Coupe to debut at LA Auto Show"